GFRG can be formed into any shape or design, making it the perfect material for many indoor applications, such as this beautifully detailed ceiling. Stromberg Architectural is a world leader in the production of many alternative building materials, including Glass Fiber Reinforced Gypsum, also known as GFRG. This article provides information on the development of this material and how it can be used today for remodeling and construction projects. The material was originally developed in England and came to the United States and Canada in the late 1970s as a potential alternative building material to traditional concrete. It has also gone by other names, such as Fiberglass Reinforced Gypsum (FRG) and Glass Reinforced Gypsum (GRG). GFRG was valued for its ability to offer strength despite being thin and light in weight. With these benefits, it was not long before companies in North America began offering GFRG as a construction material. As a pioneer in creating a better GFRG material, Stromberg Architectural began to introduce new techniques and technology associated with the material in the 1980s. Today, it is commonly used in the construction industry. GFRG contains high-density, alpha-based gypsum and glass fiber reinforcement. The gypsum plaster tends to be neutral or has low alkalinity so that it can mix well with the glass fibers that are typically used. Additives are also commonly used in the plaster industry, which are acceptable as part of the mixture for GFRG if they align with the gypsum manufacturer’s recommendations. This material does not burn. Acting like a thermal regulator, GFRG also protects the materials behind it from the heat of a flame for up to two hours. 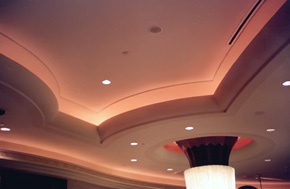 GFRG is easy to install compared to heavier materials like natural stone or plaster. Its light weight makes it easy to transport, handle, and install. It is known for its durability and long-lasting beauty, offering a cost-effective way to add specific types of architectural features to a building’s interior. The material is flexible and versatile; it can be cast to virtually any shape imaginable. GFRG is available in white so that it can be finished with virtually any paint so the color possibilities are endless. If you have a project that could benefit from using glass fiber reinforced gypsum or you want to learn more about whether it can solve a specific construction or design need, use our online contact form or call us at 903-454-0904. We also offer free estimates for your remodeling or construction project.